Is the speed of dark the same as the speed of light? This is one the questions that Lou Arrendale is concerned with, the protagonist of Elisabeth Moon’s Nebula Award winning science fiction novel. Lou has autism, but he grows up a future where prenatal diagnosis and early intervention helps people with autism lead an independent life. Lou works for an IT company with a special autism unit that takes advantage of his superior pattern recognition skills. The novel is about Lou’s internal struggle and external pressure through his employer and friends to enroll in a novel experimental therapy that might “cure” autism. In a recent paper in Science, Novarino and colleagues now claim to have identified a potentially treatable form of genetic autism. Autism genetics – misrepresented. I have learned of this paper through Twitter and press releases that mistakenly claim that autism can now be treated. Together with the response to a recent paper in Molecular Psychiatry claiming to have identified a genetic classifier using SNP arrays that can predict autism, this shows how scientific data can be misinterpreted. The genetic classifier described by Scafidas and collaborators is merely a first statistical analysis using gene pathway analysis that is far away from clinical applicability. The recent paper by Novarino and colleagues reports on a novel neurometabolic disorder in consanguineous families that presents with a complex neurological phenotype including epilepsy, intellectual disability and autistic features. This is different from the majority of patients with autism. The fact that both publications use tabloid-style titles has possibly added to the misrepresentation of the results (“…lead to potentially treatable form of autism”, “…predicting the diagnosis of autism”). Treatable diseases masquerading as autism. Missing a potentially treatable disorder is one of the many concerns when a child is diagnosed with autism. In clinical practice, patients are routinely screened for underlying metabolic conditions through urine organic acids and plasma amino acids amongst other investigations. The pick-up rate in children with autism and intellectual is negligible. Metabolic disorders masquerading as autism are a very rare exception. Genetic studies for Fragile X and Copy Number Variation are investigations that return positive findings in up to 5-10% of patients, but these results do not readily translate into treatment options. Therefore, even though patients and caregivers hope that a treatable underlying cause might be identified, this is hardly ever the case. BCKD kinase mutations. Novarino and colleagues performed exome sequencing in consanguineous families with intellectual disability, autistic features and epilepsy. They identified three families with mutations in the Branched-Chain Ketoacid Dehydrogenase (BCKDK). This enzyme inhibits the key enzyme (BCKDH) in the degradation of branched-chain amino acids (BCAA). The three BCAA are valine, leucine and isoleucine and represent essential aminoacids, i.e. these amino acids cannot be produced by the human body. When the inhibitory BCKD kinase is non-functional, BCKDH catabolizes, i.e. breaks down BCAA to a much higher extent than usual, leading to a deficiency of these amino acids. This is reflected in the very low levels of valine, leucine and isoleucine in the plasma of affected patients. With regards to known neurometabolic disorders, BCAA are usually mentioned in the context of Maple Syrup Urine Disease (MSUD). In MSUD, BCKDH is deficient, leading to an excess of BCAA that results in neurological complications including seizures. In contrast to MSUD, BCKDK mutations lead to a loss of these amino acids. The speed of dark and the speed of light. Function of BCKD kinase in the metabolism of branched-chain amino acids (BCAA). 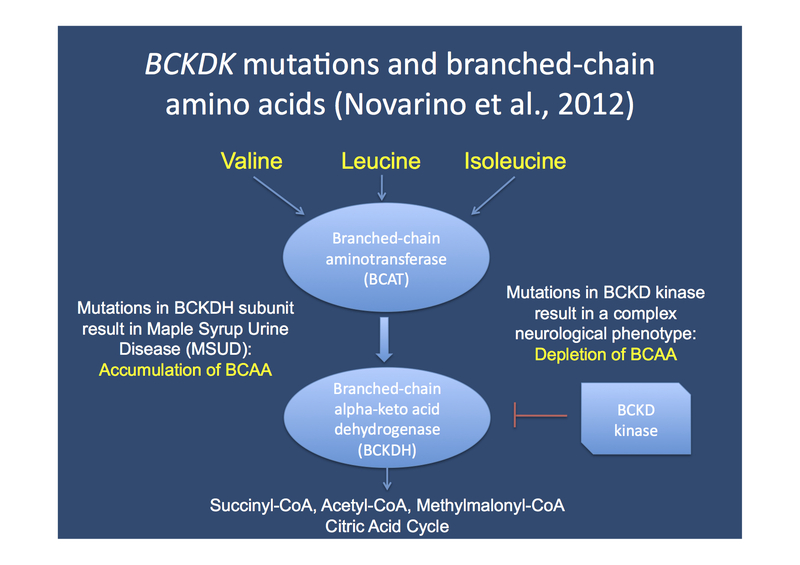 Mutations in BCKDK lead to increased activity of the BCKDH, breaking down valine, leucine and isoleucine at a high rate. This leads to a depletion of BCAA, resulting in a neurodevelopmental phenotype with epilepsy, intellectual disability and autistic features. Reversing the phenotype in mice. Novarino and colleagues continued to investigate the molecular mechanisms in mice. Interestingly, the neurological features could be completely reversed when animals were given a diet rich in BCAA. Whether a beneficial effect can be seen in humans remains to be shown, but the authors also report that plasma amino acid levels were successfully normalized in some patients. Clinical applicability. The next months and years will show whether BCKDK mutations can also be found in autism patients without additional neurological features and without a history of consanguinity. As the plasma amino acids were abnormal and since this abnormality is assumed to be causative for the disease, there might a be role for metabolic investigations in patients with autism and epileptic encephalopathy after all, if only to exclude such an abnormality. Revisiting genetic data. The authors identified the third family with BCKDK mutations by screening their exome database. This statement in the paper made me smile, as this is further proof that existing exome data needs to be curated and frequently revisited. Even though rare phenotypes such as Malignant Migrating Partial Seizures and Alternating Hemiplegia were successfully solved through exome sequencing, the genetic basis in more than 80% of patients with autism, intellectual disability and epileptic encephalopathy remains to be solved – despite the presence of exome data for these patients. This entry was posted in 2012, Familial epilepsies, Papers and tagged autism, autosomal recessive disorders, BCKD, branched chain amino acids, Maple Syrup Urine Disease. Bookmark the permalink.